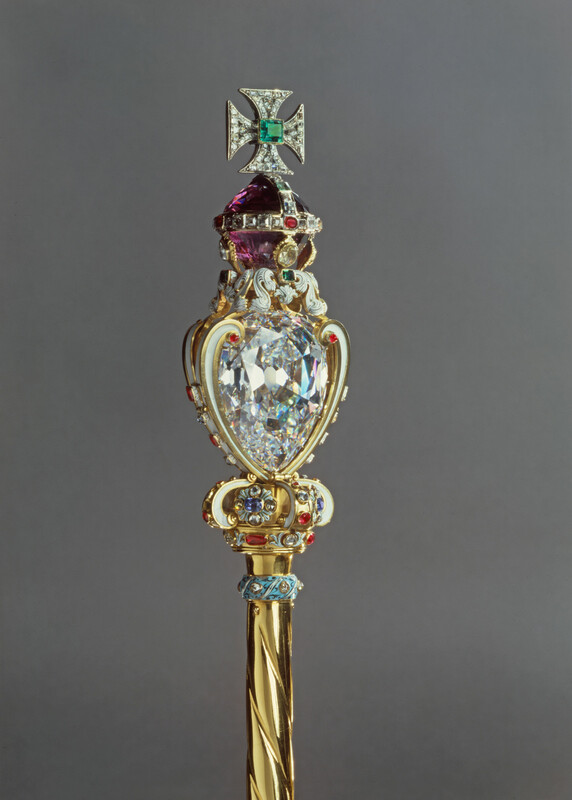 The sceptre comprises a gold rod, formed in three sections, with enamelled collars at the intersections, surmounted by an enamelled heart-shaped structure, which holds a huge drop-shaped diamond, Cullinan I, or the Star of Africa, weighing 530.2 carats. This structure is surmounted by enamelled brackets mounted with step-cut emeralds, and by a faceted amethyst monde, set with table and rose-cut diamonds, rubies, spinels and emeralds, with a cross above set with further diamonds, with a table-cut diamond on the front, and an emerald on the reverse. Beneath the Cullinan diamond are further enamelled brackets, representing a crown, mounted with rubies and diamonds. 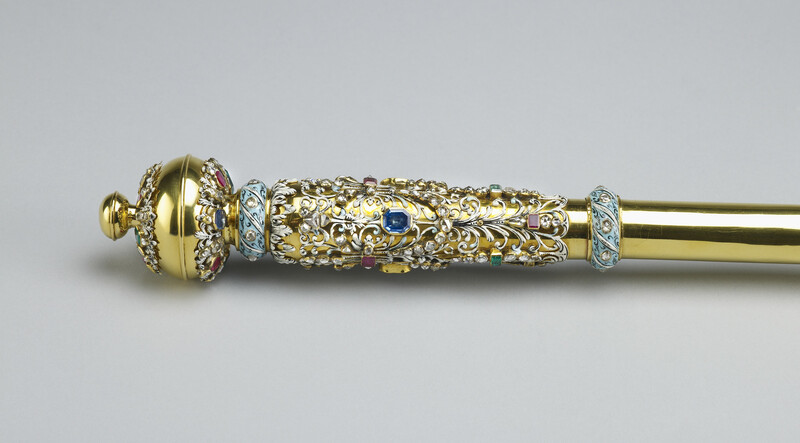 The pommel of the sceptre is enamelled and mounted with rubies, emeralds, sapphires and diamonds. 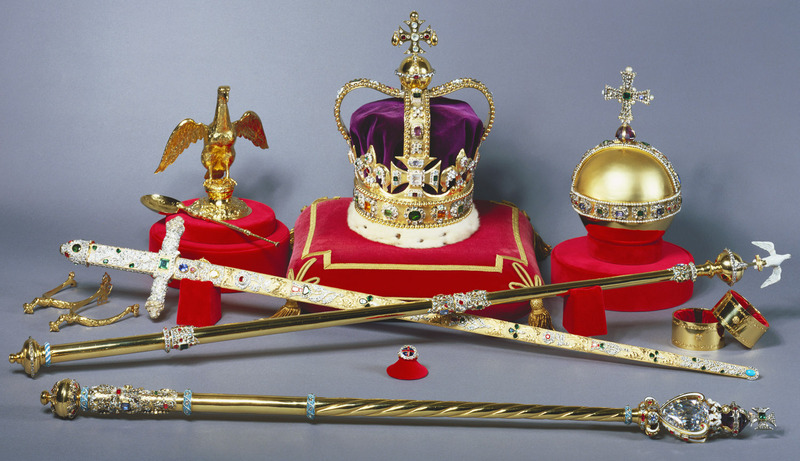 The sceptre represents the sovereign's temporal power and is associated with good governance. During the coronation service the new sovereign is first anointed with holy oil, then robed in coronation robes, and then invested with a number of ornaments symbolising the chivalric nature of kingship. These include the spurs, swords and armills, followed by the orb, a ring and then the sceptres. The sovereign is presented with two sceptres - this one surmounted by a cross and another surmounted by a dove (which represents the Holy Ghost). After the investiture, the sovereign is then crowned. The sceptre was originally made for Charles II, but has undergone a number of alterations, particularly in 1820 for the coronation of George IV, when an enamelled rose, thistle and shamrock were all added to the monde. The major alteration was made in 1910, when the sceptre was altered to receive the great Cullinan diamond. The structure which holds the diamond is hinged so that the stone may be removed and worn separately, although this has been done rarely. 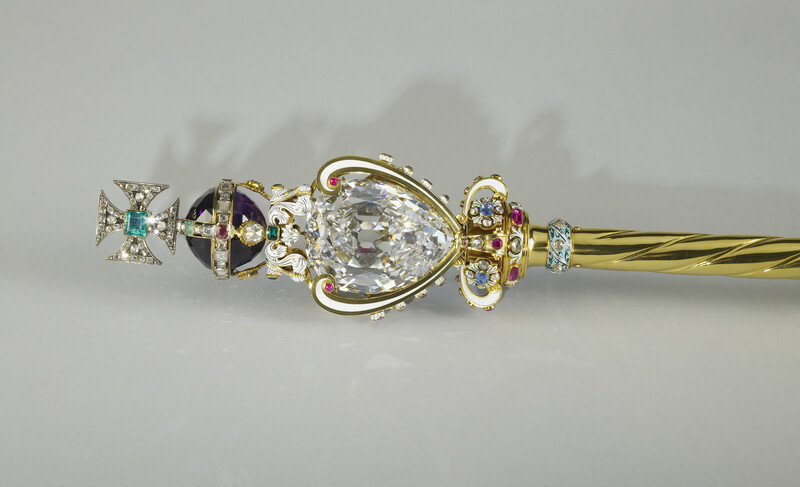 The sceptre also had to be reinforced as the weight of the diamond is so large. Cullinan I, which is mounted in the sceptre, is the largest stone cut from the great Cullinan Diamond, the largest diamond ever discovered. It was found in 1905 by Frederick G.S. Wells, at the Premier Mine, about twenty miles from Pretoria in South Africa. The stone, which weighed 3,025 carats, was named after Thomas Cullinan, the Chairman of the Premier (Transvaal) Diamond Mining Company. The diamond was presented to Edward VII in 1907 as a symbolic gesture to heal the rift between Britain and South Africa after the Boer War. It was formally handed over to the King on his birthday, 9 November 1907, at Sandringham. The stone was cut by Asschers of Amsterdam. Nine large stones were cut from the original diamond. The cutting and polishing took three men eight months to complete. A further 97 small brilliants and some unpolished fragments were also created. The largest cleaving of the stone, Cullinan I, the Star of Africa, was placed in the Sovereign's Sceptre, in 1910. It remains the largest colourless cut diamond in the world.